I have had great feedback from the Christmas Hymn of the Day mini-series so far! You can check out yesterday’s post, Hymn of the Day: Angels We Have Heard on High, and there are links to the other hymns posted. Today’s post is not so much a hymn sung by congregations, but is probably the most popular piece to play by orchestra’s everywhere! Handel’s oratorio “Messiah” is a tradition for many people during the Christmas season. Some would not consider it “Christmas” had they missed hearing the whole score of Handel’s Messiah one year! Perhaps the most familiar part of this magnificent piece is the Hallelujah Chorus. And no wonder! It has been sung by high school choirs, university choirs, orchestra’s around the world, and even sung by Flash Mobs! So, although this technically is not a “hymn” I would still consider it part of the Christmas music tradition, which is odd since the piece is based on the text in Revelation 11:15 (happens to have been the text I read this morning for my daily Bible reading with my wife, which sparked my idea for today’s post). There is a huge backstory to Handel’s Messiah so I will not post that today. But, I will give you a little interesting fact. 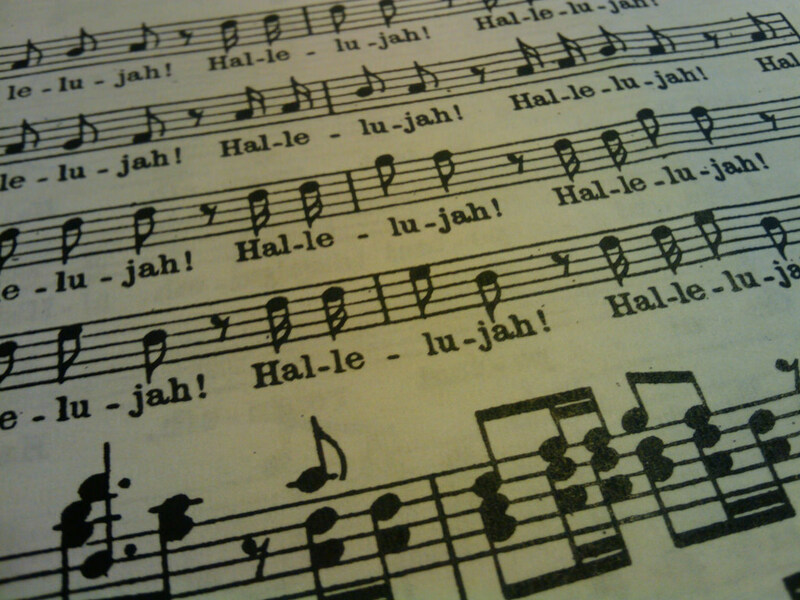 Have you ever wondered why people stand when the “Hallelujah Chorus” begins? The town is Dublin, Ireland; the date is April 13, 1742; the place is Neal’s Music hall. A choir rises and HALLELUJAH, HALLELUJAH, HALLELUJAH fills the auditorium. A great crowd has gathered to hear the premiere of what is destined to be the most widely known musical in the world. The most notable guest in attendance is King George II of England. He is so moved by the exhilarating music that he springs to his feet, an action that seemed to prompt the whole audience to do the same. From that day, wherever in the world you hear the “Hallelujah Chorus,” which is part of the Messiah, the audience stands. So, now you know! This piece has been a favorite of mine since I first sang it in my high school choir more than half a decade ago (Although for a bass the notes were incredibly high!) I look forward to watching the full 2 hour performance one day live, but until then, here is a video of the Hallelujah Chorus. If we don’t stand, certainly we should fall on our faces before Him. back here. I can see that you probably don’t make money on your website.